Most days lately I look out my window and don’t think twice, it’s all white. But actually if you can get out in this snow comfortably, it is a great time to make biochar. And biochar is black! Besides that, it is good for your soil. So good in fact that all of our local northeast Washington state politicians have signed on to a memorandum listing the virtues of biochar. HOUSE JOINT MEMORIAL 4000 State of Washington 66th Legislature 2019 Regular Session states: “WHEREAS, People working for the United States Forest Service, the Washington State University, the University of Washington, and the Washington State Department of Ecology have been researching the use of biochar and found that several potential markets exist for the product, including as agricultural soil amendments, reforestation treatments, pollution remediation, animal feed, and landscaping material;…decrease fuel loads… increase soil carbon, soil nutrient content, and plant productivity;” It goes on and on but you get the idea. Suddenly biochar is cool mostly because there is money to be made selling it. But there is also money to be saved by making it. (It costs $60/yard from Pacific Biochar with a 40 yard minimum – and that’s the wholesale price. I already have a lot of dead Ponderosa Pine that leaves a lot of ash and clogs up the chimney when you burn it in a wood stove. So we mostly burn Fir and Larch for heat. I used to burn a big 10′ diameter pile of “agricultural waste” every year. It was spectacular, but not productive. So now I burn small batches of pine to make biochar and after a lot of trial and error, feel like I have a good system. You can make fancy biochar reactors. I’ve tried my hand at that. A good one is shown in the Fall 2015 issue of The Natural Farmer in the article about David Yarrow’s biochar reactor. To understand the reactor you need to understand the two stages of burning that go on in a typical fire. When you first ignite a fire the burning material, (let’s say wood for the sake of simplicity) is heated up and volatile gases vaporize, combine with oxygen and create bright flames. To the extent that they don’t combust completely, they create smoke. When those volatile gases are exhausted, pure charcoal is left. It will combust and leave only ashes if it stays hot and is exposed to oxygen. To get charcoal – essentially the same as biochar – we need to prevent that. This second stage of combustion is preferable for barbeque – even heat and no smoke – hence charcoal briquettes. 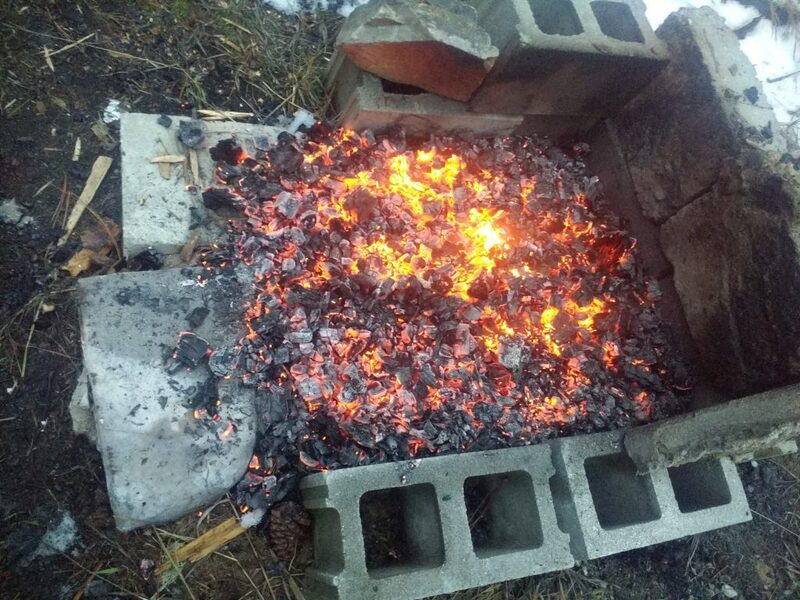 The objective of a biochar reactor is to use the flame from the volatile gases to drive all the volatile resins out of the wood while creating very little smoke and then allow the oxygen to be cut off from the charcoal before it turns to ash so you can harvest the biochar. There are two big problems with that method for me. One: even simple reactors are complicated and expensive to build and a little tricky to use. Second: once your biochar is cooled, you need to unload the reactor and start all over again. What I am going to describe is how to make “Backyard Biochar” with virtually no expense and a semi-continuous process that produces one load after another. I owe a lot in this endeavor to Gloria Flora and a simple dish that she developed as shown on her blog: http://terraflora.us/blog/. It is a cone about 3 feet across made of sheet metal. It has a flat bottom and is held together with pop rivets. The first advantage is that in a cone, the embers concentrate at the bottom even though the pieces of wood are stacked up like a classic bonfire. 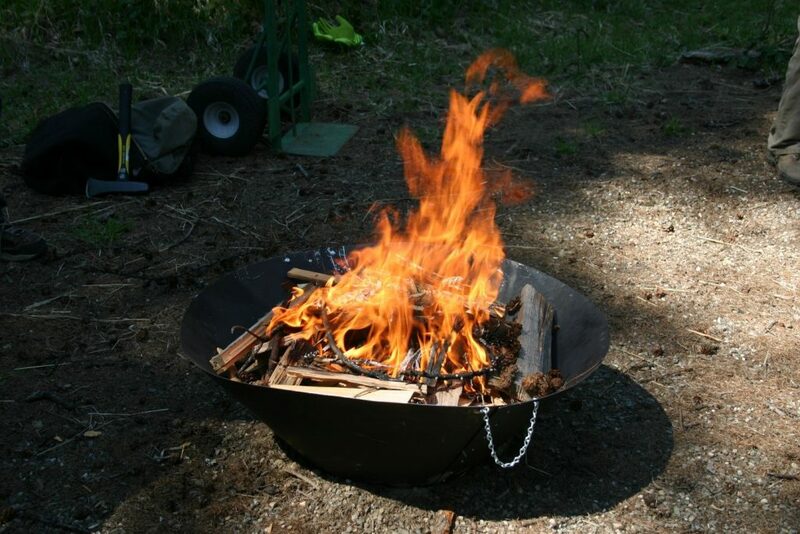 The second advantage is that the cone is light and has chain handles so once the embers are quenched, they can be emptied out into another container. That being said, you can do essentially the same thing with a little fireplace made out of concrete blocks and a flat-nosed shovel.
. It is a cone about 3 feet across made of sheet metal. It has a flat bottom and is held together with pop rivets. The first advantage is that in a cone, the embers concentrate at the bottom even though the pieces of wood are stacked up like a classic bonfire. The second advantage is that the cone is light and has chain handles so once the embers are quenched, they can be emptied out into another container. That being said, you can do essentially the same thing with a little fireplace made out of concrete blocks and a flat-nosed shovel. In a standard cycle you get a big bonfire going of wood that is fairly uniform and not over 3 inches thick. Any bigger and the piece will not burn through. Much smaller and there will be hardly any charcoal left when it stops flaming. You want the whole fire to get burning at once. It takes a half hour to 45 minutes usually to burn down to charcoal. You can tell because resins flame yellow, but charcoal just glows red or has tiny blue flames. When most of the wood has turned to charcoal and just a few pieces are still burning with yellow flames, you make your move. I use a pair of log tongs from a fireplace tool set to move the burning pieces off of the charcoal into a little stack, usually on top of a piece of bark. They keep burning. Meanwhile, especially with snow around, you can shovel some snow on the charcoal embers. It will melt and you can mix it in. (Later in the Spring a hose will work as well.) I do that a couple times until there is some moisture left on the bottom of the cone. Even though it may still steam, the charcoal is ready. I dump it into an apple bin and reload. To reload I put the still-burning pieces in the bottom of the cone. Then I add some small kindling pieces. I fan it with an old yard sign until the kindling catches fire. Then I pile up another round of 3 inch wood and soon there is another roaring bonfire. The whole cycle takes a little over an hour. You can cycle 5 or 6 times a day and still have some time for other chores in between quench, dump and reload steps. After it is cooled and dried out a bit, I run it through a shredder. (If it is too wet, it will gum up the shredder). 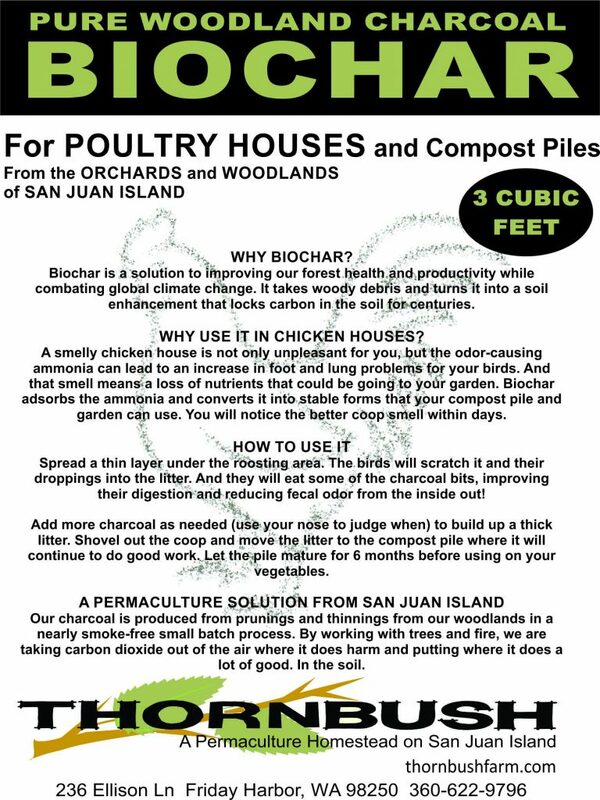 For most uses people till about 10% to 15% biochar into the soil. Although some benefits have been show for direct use as a “soil amendment”, I think that is a mistake in both thinking and practice. Soil is a whole biome of living organisms. It includes fungi, bacteria, worms, insects and year-round cover crops. Every part of it has a role that benefits the rest. Plant roots feed sugar to those organisms. When you till, you break up the hyphae, the branching filaments that make up the mycelium of a fungus. Those filaments bring water and minerals to the roots of the plants. Once broken, they take time to reform and the soil is less alive. You also break the roots of the cover crop that feeds sugar to microbs. The best thing for new organic growth is old organic growth, dead or alive. I mix the biochar with leaf compost, shredded branches, potash and grass mulch then spread it on top of the ground. Existing fungi and microbes move into the mix and integrate it into the soil. Biochar reverses carbon pollution because it is inert and sequesters carbon. But it also entrains carbon by promoting more carbon-based life in the rest of the soil. Alan Savory in his book Holistic Management warns about the dangers of growing a crop that will be removed from its own soil, burned and changed so that it will not be recycled back into living organisms. So go ahead and make biochar in your backyard. But proceed with caution.